Based on management comments on its most recent earnings call, it sounds like Holly Energy Partners may not be a publicly traded company much longer. Not all good things can last forever, especially in the world of dividend stocks. Holly Energy Partners (NYSE:HEP) has built a great reputation over the past decade and a half for delivering consistent payout growth. 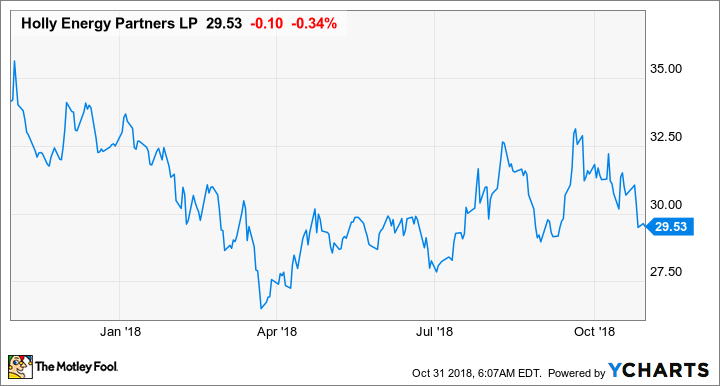 Based on the company's more recent earnings results and some of management's recent statements, it's entirely possible that parent company HollyFrontier (NYSE:HFC) may revisit having Holly Energy Partners as a separately traded master limited partnership. Let's take a look at the company's most recent earnings results as well as why management is hinting at making a move that so many other companies in HollyFrontier's position have made over the past couple of months. DATA SOURCE: HOLLY ENERGY PARTNERS EARNINGS RELEASE. EPS = EARNINGS PER SHARE. While Holly Energy Partner's earnings per share did decrease compared to this time last year, that is never too much of a concern with master limited partnerships. Cash is king, and distributable cash flow is what matters. The good news is that it increased distributable cash flow on a sequential and year-over-year basis, but it wasn't quite enough to keep up with its payout, as the company's distribution coverage ratio was 0.95 times for the quarter. Anything less than 1.0 means more cash paid out than what came in the door. According to management, this quarter was negatively affected by lower amounts of refined product and crude oil at parent company HollyFrontier's Navajo refinery complex and its Woods Cross facility. These facilities experienced some downtime for planned and some unforeseen operational issues. Management is confident that it will be able to maintain a distribution coverage of 1.0 for the full fiscal year. Data source: Holly Energy Partners. Earlier this past quarter, refining company Valero Energy announced it was acquiring all outstanding shares of its subsidiary master limited partnership, Valero Energy Partners. One of the reasons for the move was that new corporate tax rates made the MLP structure slightly less appealing than it once was. Also, Valero Energy Partners struggled to find capital projects it could develop itself and was pretty much wholly reliant on the parent company to drop down assets to it. To your point, there's no MLP equity market today. It's closed. In the past three years, we've grown our distribution 20% and our equity's declined 14-15% and unfortunately, we're not alone there, and the Alerian [MLP Index] is down roughly 25% at the same time period. So then at the same time, we've got this complete disconnect between the public and private markets in the midstream space. So we're in a tough spot. We don't know how, whether the current state of this equity market is transitory or if it's permanent. We don't know how it will interact with the private market eventually. I don't know how this is gonna resolve itself. It has to, but how it's gonna happen. So a very longwinded way of saying, there's no obvious strategic or corporate action to us at the moment. In the near term, we'll continue to look at all the options to your point there. We've seen some folks do different things. So we're watching to see how that works and how well that works. You can read a full transcript of Holly Energy Partners conference call here. For years, Holly Energy Partners has produced relatively steady and reliable growth, as evidenced by its 56 straight quarters with a distribution increase. For almost all of that time, the partnership could rely on its parent dropping down assets to it, which gave it a predictable growth pipeline. Once HollyFrontier ran out of assets to sell, though, the situation became a little trickier. Now, Holly Energy Partners needs to develop its own projects in-house. While it has invested in some high-return projects like loading racks for refined products, they have been quite small in nature and haven't been enough to keep up with payout growth. Even though the company still has a respectable balance sheet, the high yield for its units means the cost for capital is high, and without any excess cash to pay for growth, the company is somewhat painted into a corner. As Damiris noted, it is a frustrating situation for management, and it wouldn't be too surprising if HollyFrontier made a move similar to Valero's.